easy to maneuver, lightweight, sufficient suction for light jobs and holds a charge for an average amount of time. For customer service inquiries or to initiate a return, please contact Gymax LLC at gymax@yahoo.com or (909) 201-7451. 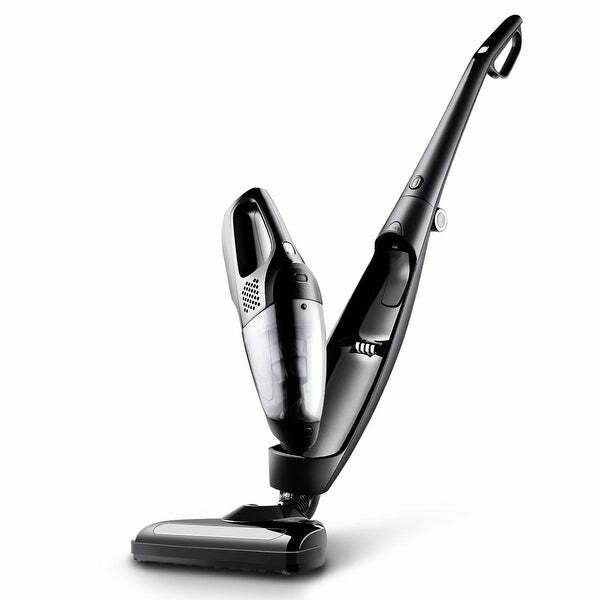 This 2 in 1 cordless high-stick and handheld vacuum is ideal for light-duty clean-ups around the home. Designed with 2 individual high power motors and strong power, it offers excellent dust pick-up ability on your carpet, floor and tiles, contributing to better cleaning work and making your home as clean as possible. And the 2 speed modes are optional to meet your different cleaning needs. The quick rechargeable and long lasting battery is perfect for fast and easy home cleaning. Besides, the folded shape help the device fit discretely into cupboards and small storage spaces. It’s time to say goodbye to the hard work and dust, this vacuum will support your busy life all the time and make it much easier! Just buy it! This is the cheapest looking vacuum I've ever seen. It looks like and performs like some toy! DON'T BUY THIS PRODUCT. You will not be happy with it.